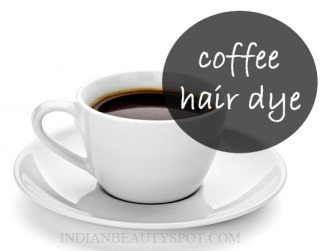 Coffee is one of the best known natural hair dye, it adds instant shine, color and highlights to your hair. It is also a safe and cheap alternative to dye your hair at home naturally and transform it from being dull to soft, smooth and shiny. * In a bowl, mix 1/2 cup of conditioner and a tablespoon of instant coffee. Next add the brewed coffee to the mixture&stir well. Apply the mixture to your hair, cover your hair with a shower cap. You can add cocoa powder to make the mix even darker. Also, the coffee mixtures can be added to henna hair dyes to amplify the darkening effects.